BBQ sauce and bread crumbs give these burgers their extra-hearty, sweet-tangy appeal. Top with cheese and enjoy. Mix meat, 2 Tbsp. barbecue sauce, bread crumbs and egg just until blended; shape into 4 (1/2-inch-thick) patties. Place on rack of broiler pan. Broil, 6 inches from heat, 4 min. on each side. Brush with half the remaining barbecue sauce; broil 1 to 2 min. or until burgers are done (160°F), turning and brushing occasionally with remaining barbecue sauce. Top with Singles; broil 1 min. or until melted. Serve with steamed vegetables and a fresh fruit salad. 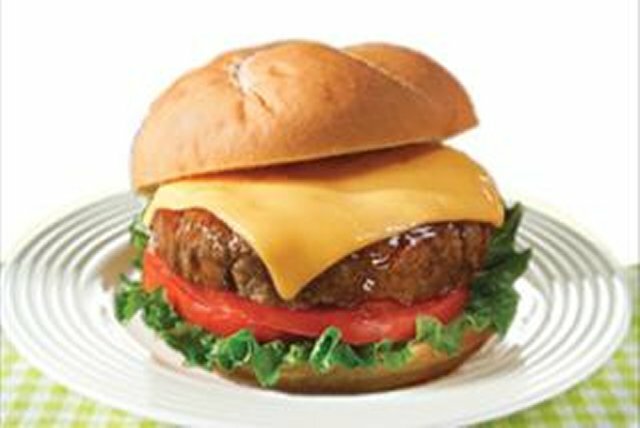 Top cheeseburgers with your favorite burger toppings, such as CLAUSSEN Pickles, onions, HEINZ Tomato Ketchup and/or mustard.